The two things you absolutely need to make this party happen: loyal subjects (friends) and craft beers. If I had to add a third to this it would be food. I mean, who wants to come to a party that doesn't have at least some yummy food? The name of the game? Finger foods. I thought of it randomly when trying to imagine what my ideal foods are when drinking beers (while keeping it semi simple and inexpensive), and decided to go with it. Beers and finger foods that are particularly greasy and/or fried....I mean, can you go wrong? Most certainly not. We told each couple to bring 6 different craft beers. Any type that they wanted. Before everyone arrived, I covered our kitchen table with kraft paper. We decided that we would use 8 of the beers to taste (you can do however many you want-but we thought tasting 18 different beers might be overkill, ha), so I took a sharpie and wrote out the numbers 1-8 on the paper. Out of the 8 beers, I made sure to use some from each couple. The rest of the beers were just for everyone to casually drink as they pleased. Then, I had one of our friends who came to the party who isn't a big beer drinker write down the names of each of the 8 beers on a piece of paper. Then, she poured enough beer for each person in plastic cups for everyone to try. Next to the names on the paper that she wrote down, she wrote which beer went with what number (but none of us that were tasting knew). This way, we didn't know which beers we were tasting and we had an unbiased opinion on them. We used a sharpie to mark who "liked" or "disliked" above each number for each beer. Afterwards, we tried guessing which beers were what numbers before they were revealed to us. And to take it a step farther....we decided that the couple that brought that beer that everyone liked the least, had to take a shot of Tito's. Because why not! However, it turned out that my husband decided that everyone should take a shot, so that's that. 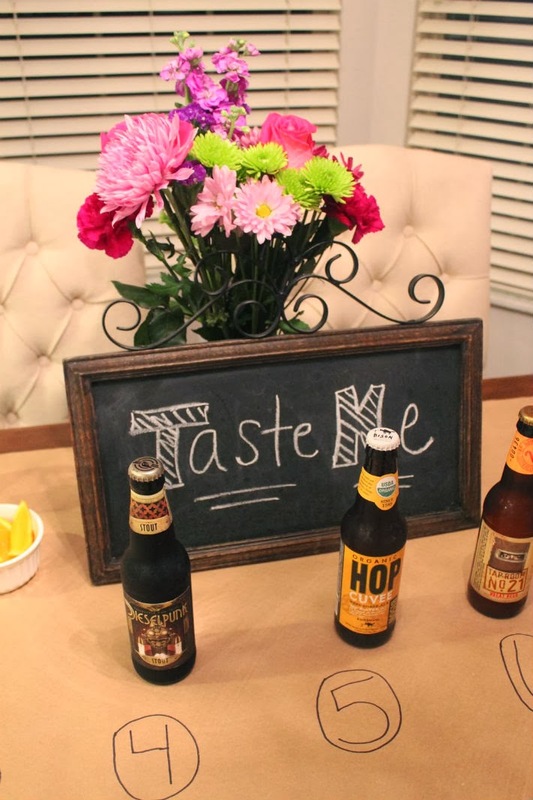 Another idea is to cover the beer labels or put a brown paper bag around them when tasting them. It was fun not knowing what you were trying, and finding out which beers you do in fact like or don't like (dark beers = not for me). The Outcome: A fun and great excuse to have a night in with friends and get to try some beers you might not have tried before! Mix the ketchup and brown sugar well in a bowl. Set aside. Preheat oven to 350 degrees. Cut each piece of bacon in half. Wrap the bacon around the water chestnuts and secure with a toothpick. Line a baking sheet with foil then place a cooling rack on top. Place all the water chestnuts on the rack and bake for 20-30 minutes. Remove from the oven and take them off the rack and into a small glass casserole dish. Pour the ketchup and brown sugar sauce over top all of the water chestnuts and cook in the oven for additional 15-20 minutes. Enjoy! What a fun idea! We absolutely love craft beer this would be such a fun night to get everyone together. Thanks for the idea! Great idea! My husband and I have been trying to think of a fun party idea and to have people over. This would go over fabulously with both our friends and families. The bacon wrapped water chestnuts look delicious too. We had a similar party but with wine a few months back. Super fun! What was everyone's favorite beer? Why aren't we neighbors, darnit?!?! ;) Super fun party, girl! This has mine and Kev's name written all over it. We live for good craft beer. Looks like so much fun! I'd love your recipe for fried Mac and cheese bites! The whole party sounds like a lot of fun! I love this idea!! :) Looks like so much fun! This is a great idea friend. 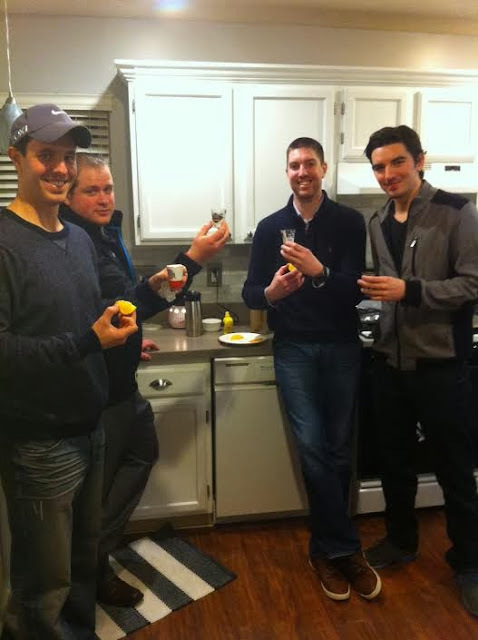 I could definitely do this one weekend for Michael and his boys or have a girls night and do wine tasting. Hope you are doing great! What a cool idea for a party! My husband and his friends would love that! what a great idea! 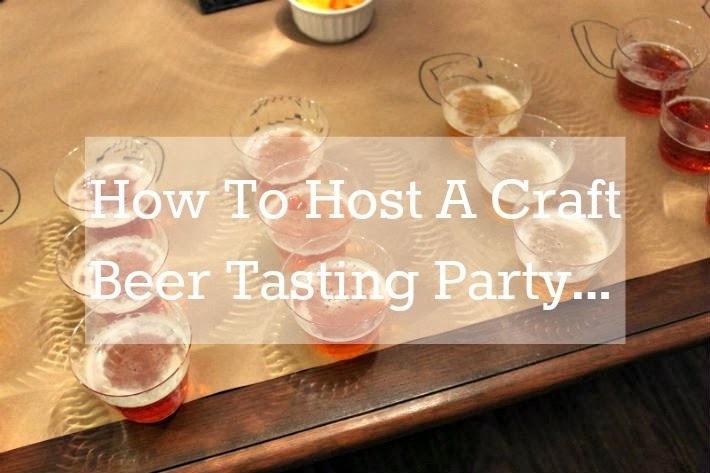 Any excuse to drink good beer is always good, but making it into a tasting sounds like so much fun. 21st Amendment is one of my favorite brewery's! My planners were an absolute delight to work with. My fiancée and I were really worried at the beginning phase of event management our wedding but every experience we had with these guys was great.